To use the new cart, you need to be on dap 4.5.2 / LL 1.9.2 (or a later version), and the NEW DAP Shopping Cart – 1.4 (or a later version). 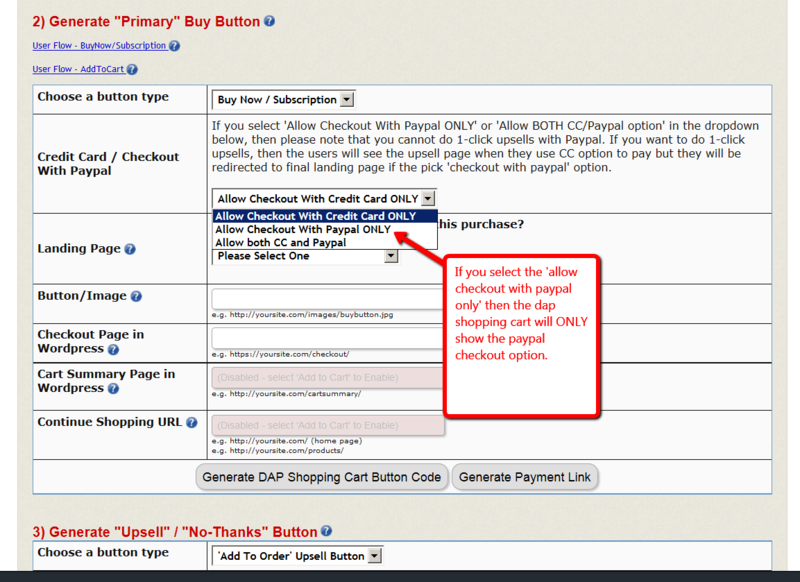 1) Go to DAP admin -> payments -> Generate buy buttons page -> DAP Shopping Cart tab. 2) In the step 1 – Select Product & Processor, you can select any option (authorize.net, paypal pro or stripe in the dropdown). It does not matter. Whatever option you pick here, will be ignored if you want to offer just the ‘checkout with paypal’ option in the next step. 4) In the generated ‘payment button code’ or ‘payment link’, you can replace all occurrences of ‘https’ with ‘http’. You do not need to enable https on your site if you only sell using paypal standard. You only need to use https if you allow users to enter CC info on the cart checkout page. 5) Also make sure to integrate your paypal standard account with DAP using this documentation otherwise the paypal IPN will not be connected to DAP. See this blog post on the other great features that the DAP cart offers even if you just have a Paypal Standard account. Please refer this document to install VB 5. You can integrate it the exact same way as VB 4.x. The only difference is in the /dap/dap-config.php. 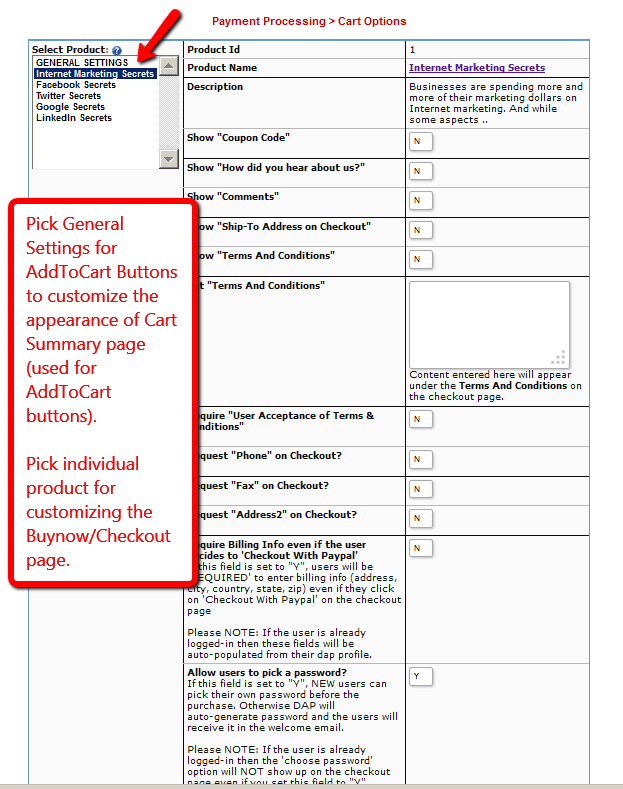 Here’s how you can customize the DAP Shopping Cart -> Checkout page. Create a copy of checkout.html. Save it as customcheckout.html. Upload it back to /wp-content/plugins/dapshoppingcart/includes/templates/dapcart/template1 or template2 folder. Now the changes you made should show up on the checkout page. Create a copy of buynow.css. Save it as custombuynow.css. Edit whatever you need to in custombuynow.css. Upload it back to /wp-content/plugins/dapshoppingcart/includes/templates/dapcart/template1/css folder (or under /template2/css folder if you are updating template2 css). Now the style changes you made should show up on the checkout page. If you want a redeem button to show up on your sales page or any other page to allow users to redeem access to a product, then just place the REDEEMCREDITS shortcode on the page and automatically a redeem button will appear on the page. 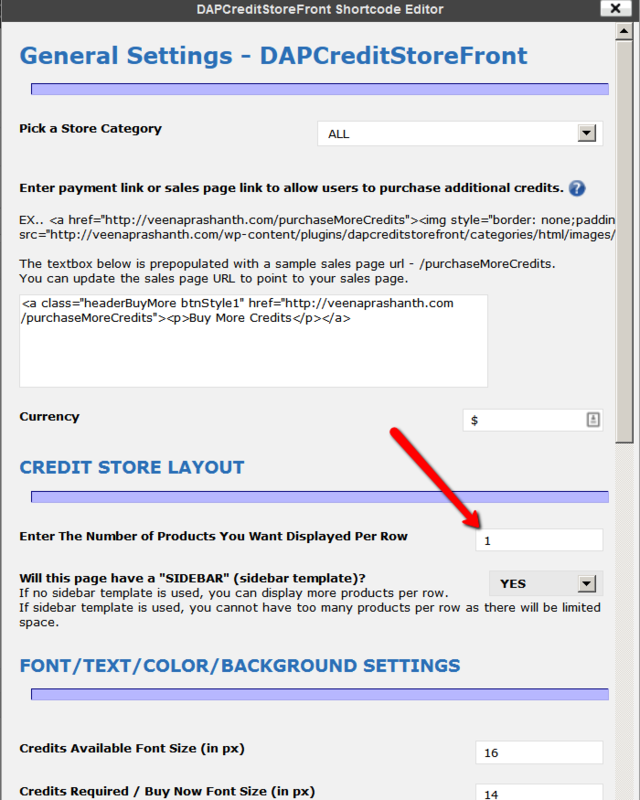 We also have shortcodes for CREDITSAVAILABLE and CREDITSREQUIRED that you can place on any WP page. Here you can replace productId with the DAP product Id of the product that you want to allow users to redeem using credits. This shortcode will display the number of credits required to redeem the product using credits. This shortcode will display the number of credits the credit store users have in their dap account. Replace http://YOURSITE.com/login/ in the shortcode above with the dap login page url on your site. This shortcode will allow users to get access to products using credits (instead of cash) by clicking on the REDEEM button. If you are a member, please "Login Here To Redeem Credits". Replace YOURSITE.com above with the name of your site. How to create a Credit Store Child product? 1. The product that the users can get access to by redeeming their credits (in the store) is what we refer to as CHILD product. 2. You can give any name to the product (does not have to be called ‘child’). 3. Each product that needs to serve as child needs to be designated as Credit Store Child in DAP products page OR in DAP Admin->Credit Store->Storefront Settings page. 4. You cannot use regular dripping if you make a product a Credit Store Child Product. 5. Users can earn credits by purchasing master product and then spend the credits to get access to child products in the credit storefront. 7. Users can redeem just the content that they are interested in by redeeming access to individual content instead of full product. 8. How to add setup a Child Product? Create the product in DAP products page and desginate it as CS Child Product. Go to the Notifications tab of the child product (in dap products page) and setup the welcome email that the users will receive with their id/password when they redeem product in the store. Go to Content Responder tab of the child product (in dap products page) and set the content that you want to make available under this child product. If you do not want to allow your users to redeem their credits at ‘content level’ (pay-per-post), then you can leave the credits per post set to 0 (or whatever the default is set to). IMPORTANT NOTE: Whatever content you add in the Content Responder tab is the content the users will have access to when they purchase the product via credits in the store. Go to DAP Admin -> Credit Store -> Store Front Settings page, select the child product you created above, and then setup the rest of the fields on this page. If you setup a child product with ‘content-level credits disabled’ in DAP Admin -> Credit Store -> Store Front Settings page, then the ‘content level credits’ set in contentresponder section does not matter. It will not get used. The product level credits (set in DAP Admin -> Credit Store -> Store Front Settings page) will be used. If you have setup a child product with ‘content-level credits enabled’ or if you switch from content-level-credits disabled to enabled mode, then the ‘content level credits’ set in contentresponder section DOES matter. DAP will add up each individual content level credit to derive the total number of credits needed to buy the product. So remember to set the ‘required credits per content’ correctly if you use content-level credits (pay-per-post). Create an association between the child and the category otherwise the child product will not show up in the store. Do this for every child product that should show up in the store. Now visit the Credit Store Front page (created by clicking on the CS editor icon in WP admin -> pages -> visual tab) and you will find the child products listed there in the store. If your users want to redeem access to child, then as long as they have enough credits in their account, they can login to their membership, visit the storefront page and redeem credits. They can earn credits by purchasing the master product. You can create multiple master products each allowing different number of credits (5-credits, 10 credits, 50 credits etc). This way the users can purchase the master and get 5, 10, 50.. credits and then visit the store to redeem it.